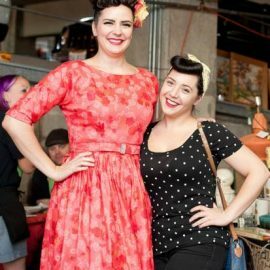 July 15th, 100 vendors of all types of vintage will be on hand and while you'll find all categories of vintage, you'll also find an extra touch of the 1950's and vintage clothing. This doesn't mean July's Vintage Garage will only feature Rockabilly and vintage clothes. The Garage enjoys it's full variety of vintage each month, vintage furniture, home decor, midcentury modern, vintage clothing, vintage lighting, home decor and so much more. Themes are just added fun. 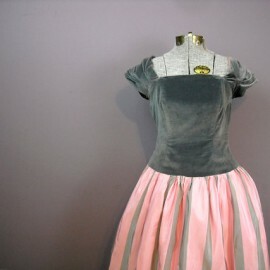 Dress in your favorite vintage get up or enjoy watching the outfits. Chicago Street Style at it's BEST! Rockabilly is an early form of rock and roll that was popular in the 50's. It combines rock and roll with swing, jazz and boogie. Pompadours, swing dancing, circle skirts and leather jackets are spotted easily in this crowd. Elvis is considered Rockabilly, along with Buddy Holly, Chuck Berry and many others. We embrace this time in postwar America and spend a day celebrating it Uptown, Chicago. Putting together the pieces for the Rockabilly lifestyle takes time and patience. It is rich with some of the very best in post-war American culture. You've got to have the right look, clothes, home, social life and friends. Maybe a Midcentury-style home with all 1950's fixings or 1950's dresses and shark skin suits. Don't forget weekend getaways with the top down and perhaps a Supper club or two. Rockabilly even has it's own convention in Las Vegas every year: Viva Las Vegas. It's all about the cars, music, contests, bands, dance, pin-up merchandise and everything a budding or experienced Chicago Rockabilly enthusiast could want. Rockabilly and Tiki fit well together, with an emphasis on the old Tiki bars of years past and 1950's trips to Hawaii. Think Hawaiian sarongs, Mai Tais, vacations in Hawaii and old Tiki dolls. It's for the vacationing 1950's lifestyle enthusiast! We'll see you July 15, 2018 at the Vintage Garage in Chicago! Our vendors search long and hard for pre-1980s goods to bring to the Vintage Garage Chicago flea markets each month. 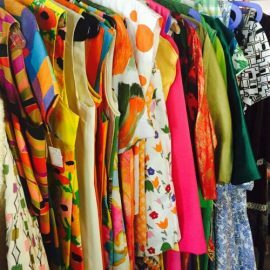 You can always expect to find fresh-to-the-market merchandise, from vinyl records to vintage clothing, vintage dresses to Midcentury furniture and so much more. We attract vintage sellers from all over the Midwest. Dealers from Illinois, Iowa, Wisconsin, Michigan and Indiana. In April, we had a vendor all the way from San Francisco! A great variety can be found. Vintage furniture, industrial furniture, pop culture, comic books, books, kitsch, decor, Art, Danish Modern, vinyl lp's. They hunt for it and bring it to you the third Sunday each month in Uptown, Chicago. Each month we average about 100 vendors. We also have cookies, brownies and PIE! Enjoy a beer or two and 3 floors of vintage shopping! This vintage flea market never disappoints. Those who just enjoy unique items are welcome. Interior designers and decorators, we hope to be your source for vintage Chicago flea markets!